New Huntington bookstore downtown sure to satisfy the avid-reader and thrifty alike with its wide variety and affordable prices. An award-winning author and poet Jen Campbell states, “Perhaps that is the best way to say it: printed books are magical, and real bookshops keep that magic alive.” The bookstore is a common staple in big cities and small towns alike — a place where a person could lose themselves in a fictional world for hours or become immersed in a culture vastly different than their own. In February of 2016, Rex Fredrick and fiancé Renee Platt brought that experience to Huntington. The desire to own their own business sent them out to neighboring towns to survey what worked and what didn’t. That’s when the idea for Turn the Page: Books & More was born. Their inventory is composed of gently- used books from people in the community. They know now how big the desire was for a bookstore here in Huntington. The cozy little store rests at 445 N. Jefferson street on the corner of Jefferson and Washington right in the middle of downtown. The owners believe they are in the “perfect spot.” They get plenty of publicity with their location and sign out front, but are grateful that it hasn’t become overwhelming. “We want to keep it pretty low-key, but we have loved the support we’ve received from the community,” Fredrick says. You can find a wide range of literature at Turn the Page, including sci-fi, romance, mystery, history, YA novels and the classics. 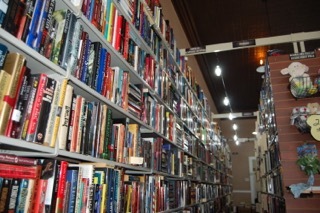 Any kind of book you are looking for you can find at Turn the Page. In addition to books, they have a selection of classic vinyl albums, coffee mugs, jewelry and stuffed animals. This might be the reality of the bookstore with the amount of love and support registered in the community. If you have a stack of books you don’t want anymore, you can donate them to Turn the Page for in-store credit. They’re open Tuesday through Friday from 10 a.m. until 6 p.m. and on Saturday from 10 a.m. until 4 p.m. Impressive! As a bookophile & grandpa I confess that I may be somewhat biased.